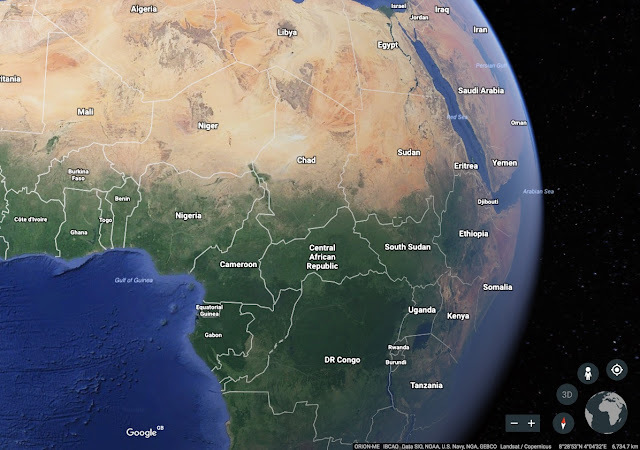 New Google Earth has been released, and there are some good (and not so good) elements. These are my initial thoughts on first look during this week. It's now optimised for Chrome and also for DESKTOP machines, so won't work on my MacBook Air at the moment, which is a bit annoying... It also won't work on mobile devices. And it won't work on my classroom desktop machine which is an HP - just hangs and tells me it's loaded 0 of billions.... This is a little inconvenient, but at least you can still use older versions such as the Google Earth Pro I've been using for a few years. It looks good if you can get it to work, and there are plenty of new features - some of which aren't too useful... but some of which will speed up its use: the search function is much improved for example. The switch from 2D to 3D reveals (in many but not all locations) some interesting 3D renderings of aerial scenes. This was a bit random - switching from 2D to 3D provides a new Ken Burns style rotation, but it's hard to get the view to exactly as you want it, and then it tends to be quite a low level flat view, without the option to see distant landscapes. Having said that, the effect is really very impressive if you go to a location where it's enabled, which is not the whole of the UK yet it seems. Cities work well. Ely is still flat, and has lost other elements too, whereas Norwich and Sheffield work really well. There are some new stories which have been curated for the new Earth, such as HOME. The HOME stories are also trailed in the Google Earth extension which I have on Chrome, which shows a new aerial view each time I open a window. Google Earth’s Gopal Shah said: ‘With the new Earth, we want to open up different lenses for you to see the world and learn a bit about how it all fits together; to open your mind with new stories while giving you a new perspective on the locations and experiences you cherish. I've come to the conclusion that I'll probably carry on using the Google Earth Pro version that I have downloaded to my machine until the iOS version comes out, when hopefully the interface is back that makes it useful, and maybe other aspects have been amended from this current launch version. I've not tried it with my 3D Space Explorer mouse yet either to see whether that works well. The Google World Wonders site which I worked on a few years ago also seems to have disappeared... I luckily downloaded all the education packs several years ago, and have then on my Mac. Does anybody else have any thoughts on the new Google Earth?